San Diego Police said Thursday a 16-year-old accused of punching a man unconscious last month during a robbery at Horton Plaza is linked to a second violent robbery in the Gaslamp Quarter. 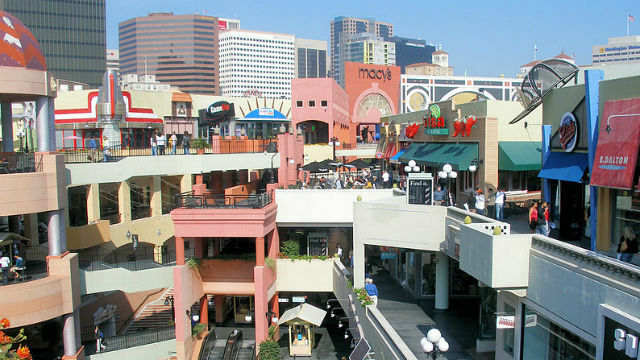 The suspect, whose name was not released because he is a minor, was arrested last week along with a 17-year-old suspect in the second attack who was not believed to be involved in the Horton Plaza robbery, San Diego Police Lt. Ernesto Servin said. The mall robbery sent the victim to a hospital with serious head injuries, though he has since been released from medical care and is expected to make a full recovery. Police said the 37-year-old victim was looking at his phone on the second level of the downtown shopping center around 8:30 p.m. on Nov. 18 when three to five people approached and one of them struck him in the back of the head, knocking him unconscious. The suspects took off with the man’s phone while the victim was taken to a hospital with facial fractures and other injuries. Detectives eventually identified all of the assailants and arrested the 16-year-old boy on Nov. 27, Servin said Thursday. Police asked anyone with information about either incident or similar robberies in the Gaslamp Quarter area to call the SDPD’s robbery unit at (619) 531-2299.